The Assumption of Mary, 1993, Xavier University. Frederick James Brown (February 6, 1945 – May 5, 2012) was born in Georgia and raised on the South side of Chicago. In the 1970s and 80s, Brown worked as an artist in New York, and emerged as a driving force in the resurgence of expressive figuration in the international art world. He is especially noted for his numerous portraits of jazz and blues artists. Bearing a university art degree in painting and psychology from Southern Illinois University, Brown was largely self-taught, his work incorporating a rich fusion of both high art and more folk-art culture. His work’s bold style was informed by a combination of his interests in jazz and blues music, his African-American Seminole and Choctaw ancestry, Southern folklore, and European religious paintings. Art historian and critic Barbara Rose described Brown as a part of the group of “rule breakers” who were defining the decade of the 1980s. During that time, the artist began concentrating on portraits of musicians, creating a series that his family said came amounted to over 300 paintings. His subjects included seminal figures of 20th-century American music, among them Louis Armstrong, Ray Charles, Billie Holiday, Thelonious Monk, B. B. King, Count Basie, Bessie Smith, Ornette Coleman, Lionel Hampton, and Jelly Roll Morton. The paintings have been exhibited in shows at the Kemper, the Studio Museum in Harlem, the New Orleans Museum of Art, the National Portrait Gallery at the Smithsonian Institution, etc. Left: Brown, Federick J., Truman Capote as a Child, 1995, mixed media. on paper. Courtesy Arthur Roger Gallery. Right: Brown, Federick J., Truman Capote, 1995, mixed media on paper. Courtesy Arthur Roger Gallery. In 1988, Brown had the largest retrospective by a Western artist in the People's Republic of China. An exhibition featuring 100 of his expressionistic paintings and drawings created from 1968 to 1988 was held in China's Museum of the Chinese Revolution, making Brown the only Western artist to also have had an exhibition at the National Museum in Tiananmen Square. Brown taught art at the Central College of Fine Arts in Beijing for periods between 1985 and 1987. Furthermore, during that time, Brown was the subject of a short film documenting his first visit to the PRC, which aired on Chinese national television. 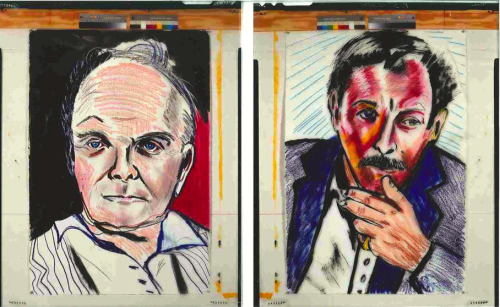 Left: Brown, Frederick J., Tennessee Williams, 1995, mixed media on paper. Courtesy Arthur Roger Gallery. Right: Brown, Frederick J., Jelly Roll Morton, 1995, mixed media on paper. Courtesy Arthur Roger Gallery. In 1993, Brown unveiled "the Assumption of Mary" at Xavier University, Louisiana. To this day, the painting remains the largest religious work of art on canvas at three-stories tall. A year later Brown exhibited "the History of Art", a series of 110 paintings chronicling the progression of art through human history through a personal lens. Brown, Federick J., 1995 mixed media on paper. Courtesy Arthur Roger Gallery. In September 2008, Brown organized a pivotal symposium on the Creative Movement of the 1970s at Cornell University, inviting fellow artists, jazz musicians, dancers, and poets to speak. Those in attendance included bassist Charlie Haden, saxophonists Henry Threadgill, Sam Rivers, and James Jordan, artist Tony Ramos, poet and activist Felipe Luciano, songwriter Malcolm Mooney, writer and music critic Stanley Crouch, designer Jean Claude Samuel and many others. 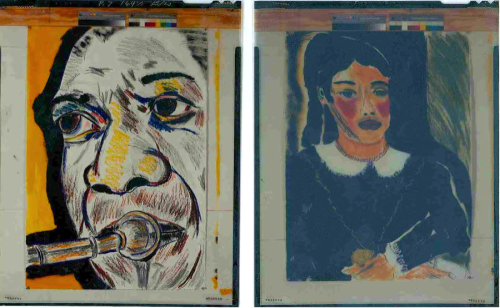 Left: Brown, Federick J., Sketch of Louis, 1995, mixed media on paper. Courtesy Arthur Roger Gallery. Right: Brown, Federick J., Mari LaV au, 1995, mixed media on paper. Courtesy Arthur Roger Gallery. Frederick J. Brown’s work is included in the collections of the Smithsonian National Museum of American Art, the Metropolitan Museum of Art, the New Orleans Museum of Art and the American Jazz Museum, as well as other institutions worldwide. Brown has had solo exhibitions at the Studio Museum of Harlem, the Marlborough Gallery, and the National Museum of China in Beijing.